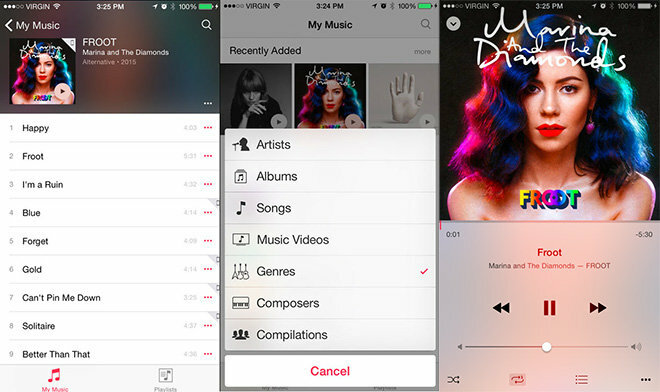 Following the release of iOS 8.3 last week, Apple on Monday issued the first iOS 8.4 beta to developers featuring a "sneak peek" at its revamped Music app. According to Apple's release notes, iOS 8.4 build 12H4074d comes with an all-new Music app that combines a fresh new look with powerful features, including a new MiniPlayer, improved "Now Playing" screen and Global Search integration. Music's redesign lets users personalize playlists by adding custom images and descriptions, while new functionality allows for direct playback from the app's album list. In addition, a Recently Added section surfaces tracks and albums that were recently imported or purchased to the top of a user's library. Other improvements include a MiniPlayer that allows playback controls while browsing Music's library, streamlined iTunes Radio navigation, a new Up Next icon to see what song is coming up and tweaks to the Now Playing pane. New Global Search integration pulls in results from anywhere in the Music app and allows for iTunes Radio station creation directly from Search. The first iOS 8.4 beta is available now through Apple's Developer Portal. To go along with the new iOS build, Apple released a new Xcode 6.4 beta with software development kits for iOS 8.4 and OS X versions 10.9 and 10.10. The latest Xcode software is also available on Apple's developer webpage.